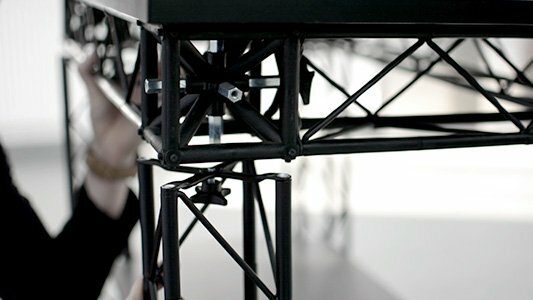 Exhibition trusses combine functionality and design in a unique way: The modern system consists of an aluminium core which is encased in black or white plastic. This material combination ensures the optimum stability with a very light weight. 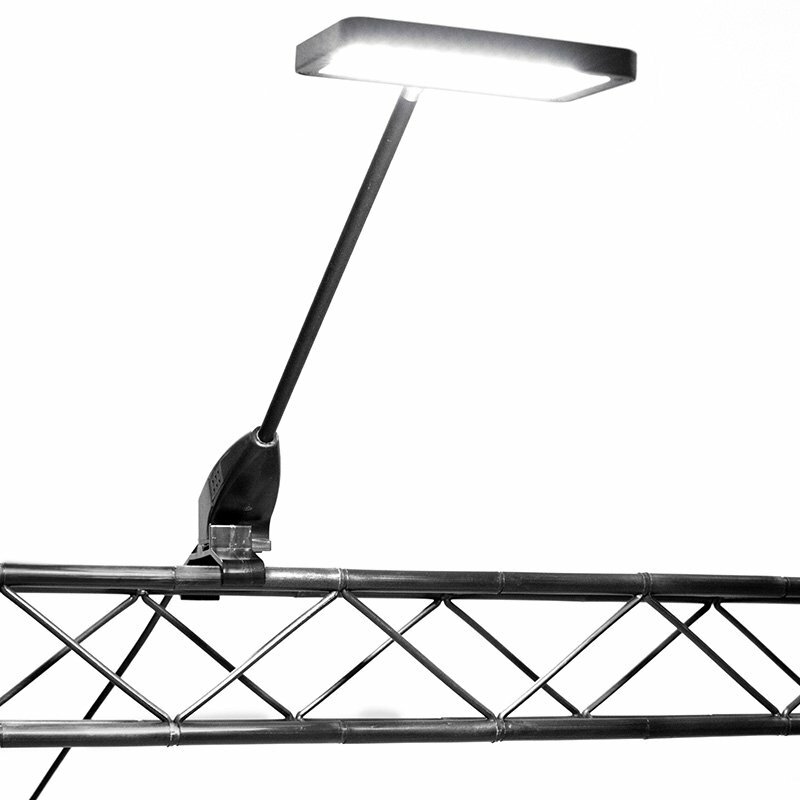 The simple connection system is completed with a metal screw and guarantees comfortable and completely tool-free assembly and disassembly of the system. Intelligent technology which will impress you. 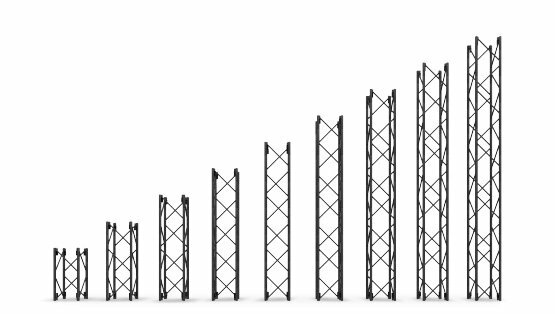 As simple as a building block: The truss elements are available in various lengths and strengths and can be combined flexibly, rebuilt or remodelled. 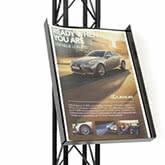 Ideal if you would like to set up your exhibition stand in various ways. 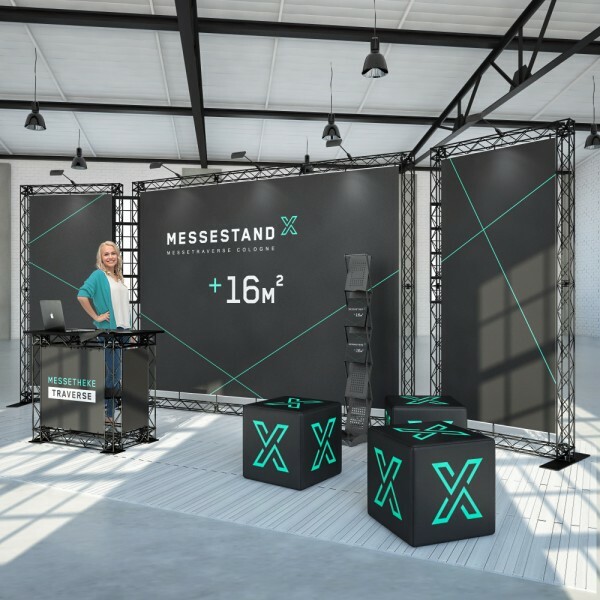 The cubes connect the individual truss elements exactly the way you want it. Square, practical, great. 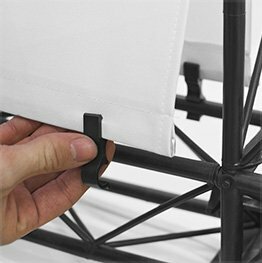 The individual truss elements can be put together like child’s play and fixed together with a hand screw. 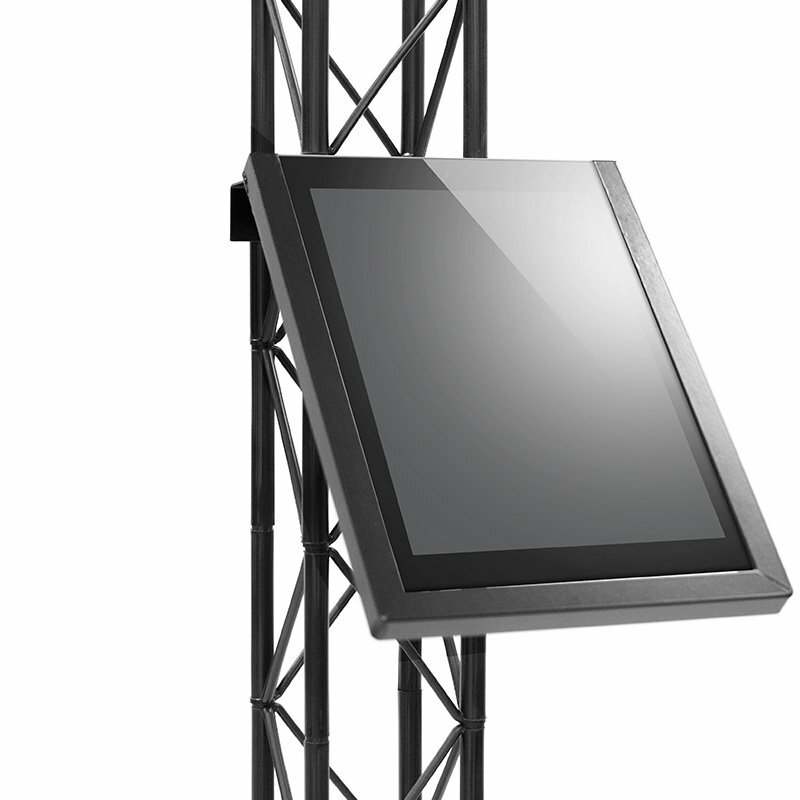 You require neither tools nor trained personnel to put together your exhibition stand. 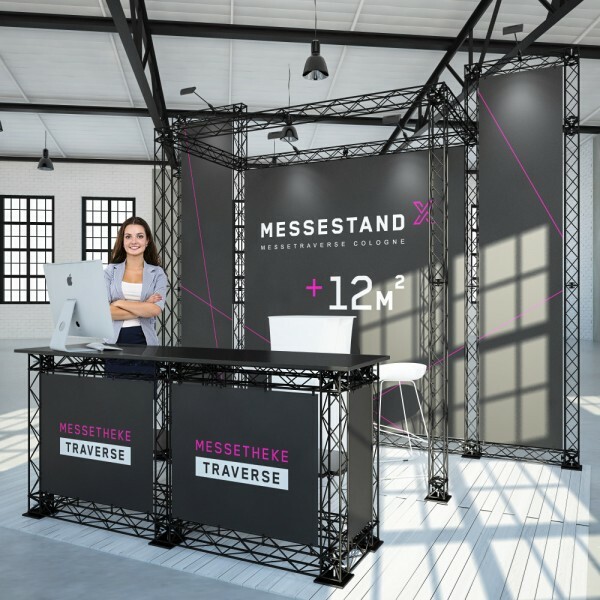 You aren’t just able to put together your completely unique desired exhibition stand from exhibition trusses – you can also combine these in infinitely new ways, add accessories or reduce or expand it depending on the event. 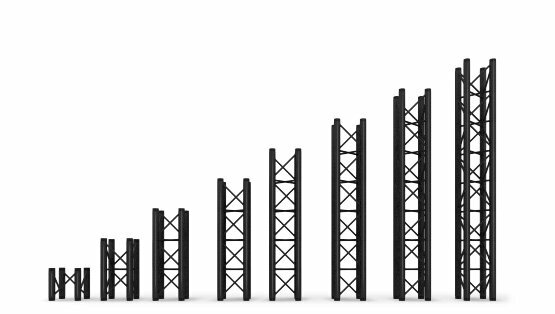 The low weight of the truss system turns transportation into a stress-free matter. 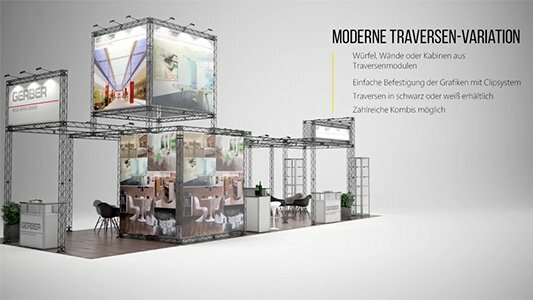 The individual modules can be transported without a problem in personal cars or vans, depending on the size of the exhibition stand. 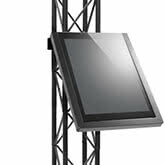 The 4-colour print on display special fabric is applied with a fixing strip and clip system to the truss modules. The motif can thus be changed with just a few hand movements. All materials are naturally B1-certified. 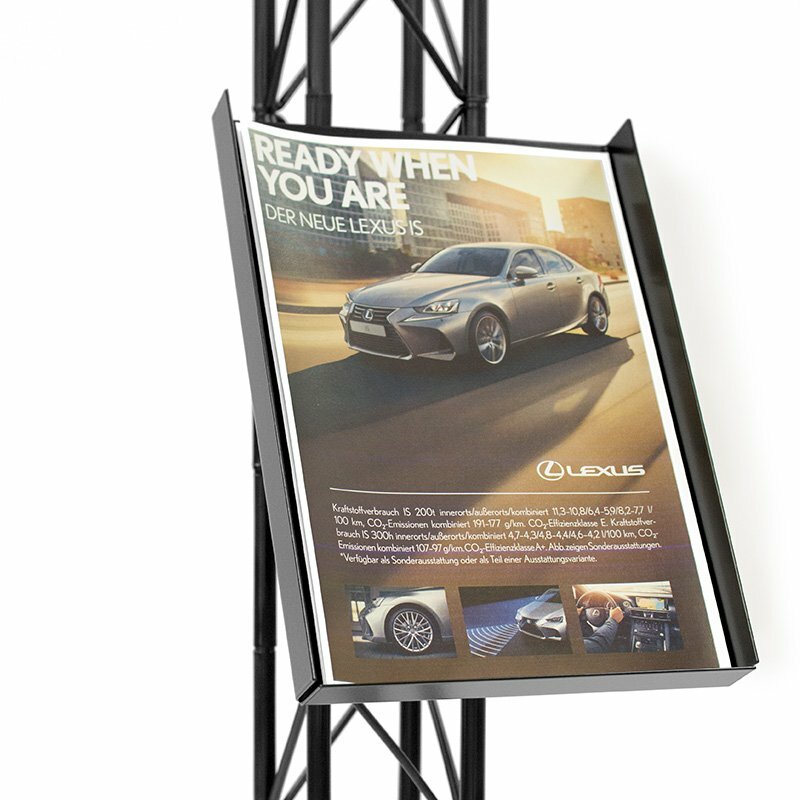 Exhibition trusses – Flexible. Mobile. Simple. 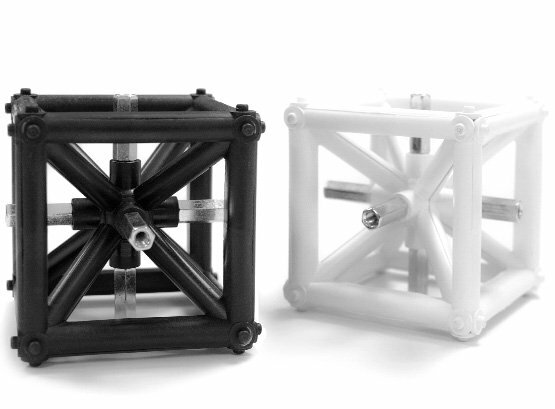 The individual modules are available in four versions (10 x 10 cm), (15 x 15 cm) and (20 x 20 cm) and (25 x 25 cm). 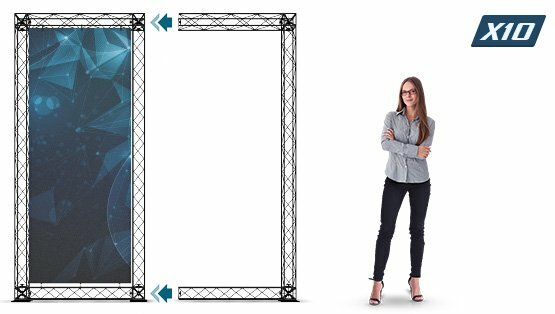 The height and width of your exhibition stand can be defined precisely according to your plans thanks to the different lengths of the individual elements (from 10 – 200 cm). 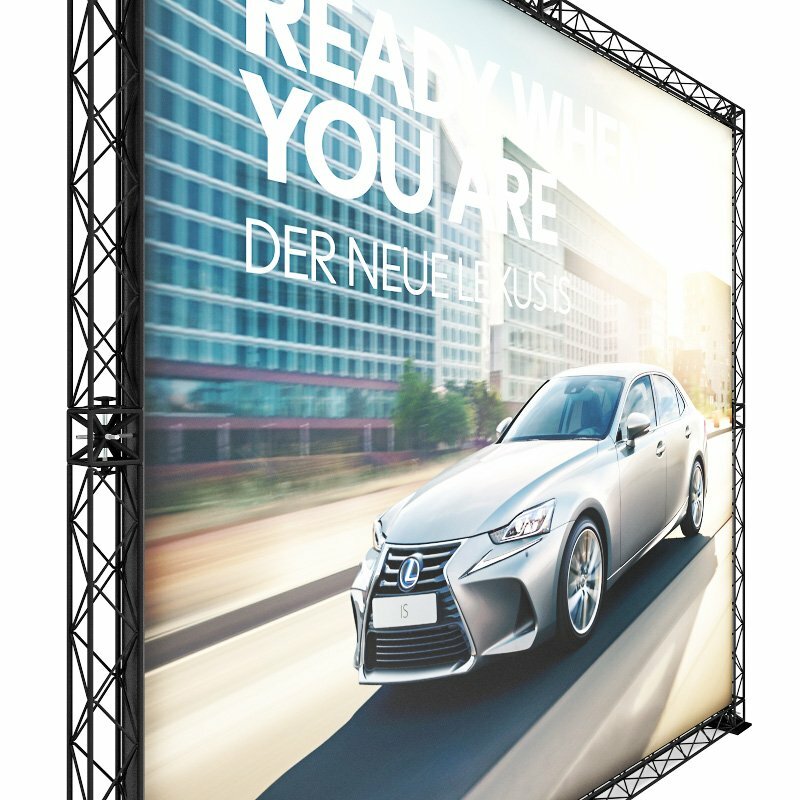 For a stand width of 2.50 m – 3.50 m, we recommend the modules x10 or x15. 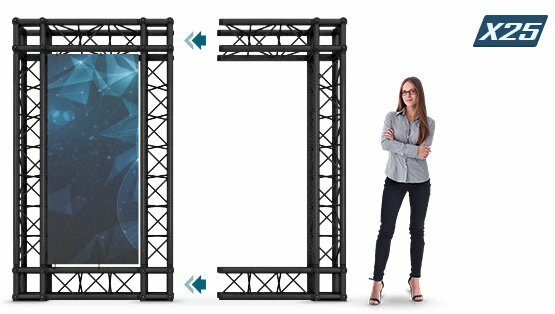 From a span of 4.00 m, the modules x20 and x25 ensure optimum stability. 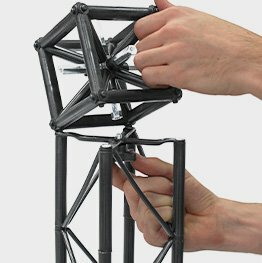 Special feature of the 20×20 modules: These can also be folded together to save space during transportation. 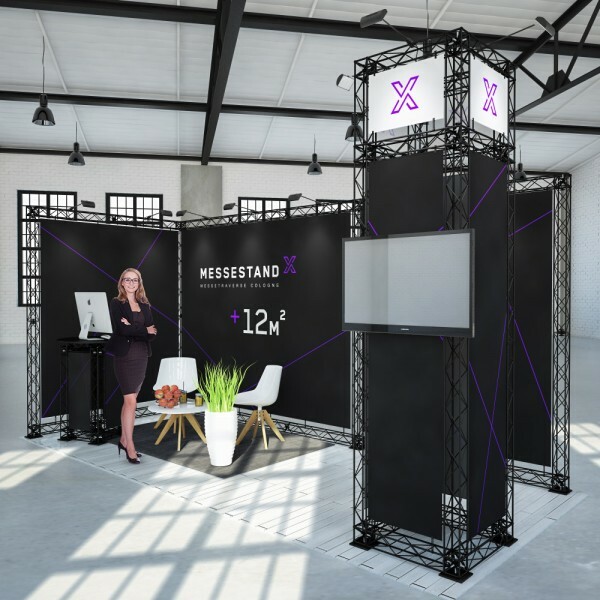 An exhibition stand in the truss building style offers a particularly wide spectrum of options for your event or exhibition: Diverse stand shapes and sizes can be put together in a modular fashion using the individual truss elements and numerous extras. 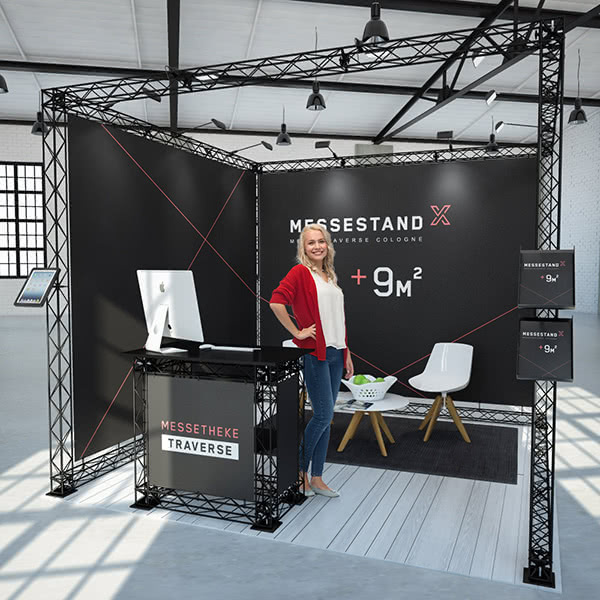 Whether it’s a small inline stand, contorted corner stand or large island stand: With an exhibition stand in the truss building style, there are no limits to your creativity. 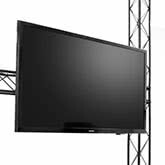 This exhibition system is ideal, especially for large exhibition stands which require a particular level of stability. 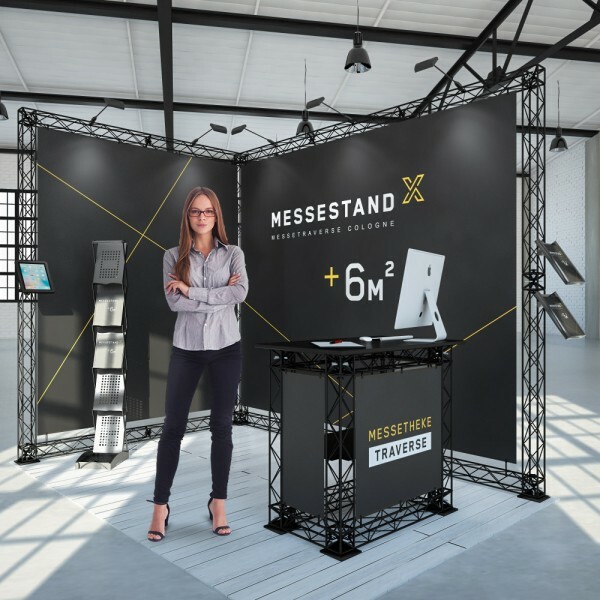 Thanks to the flexible connecting system, you can change your exhibition stand at any time in any way you want, remove elements, reconnect or add new trusses. 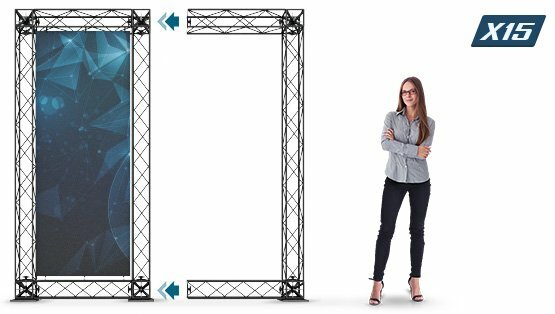 In addition, you can also construct advertising counters, cubes or high advertising columns with the innovative truss exhibition construction system. To match, you can also find a large selection of individual accessories. 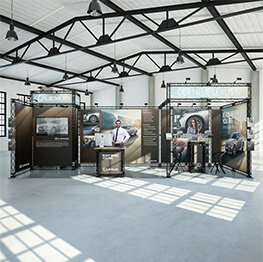 Discover the wide range of options and learn more about the details by rolling the mouse over the exhibition stand illustrated here. 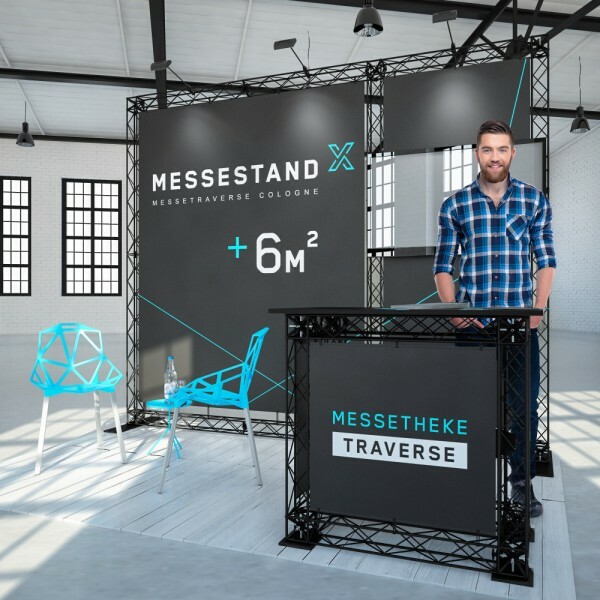 Whether it’s a round standing table, modularly expandable counter with attachment or information counter: The truss system allows you to put together flexible tables or sideboards. 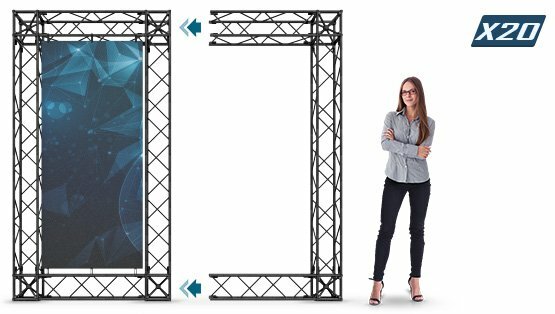 Present your products on your exhibition stand: It doesn’t matter if your exhibits are appliances, textiles or large objects – presenting your goods in a truss building style offers the perfect solution, guaranteed. 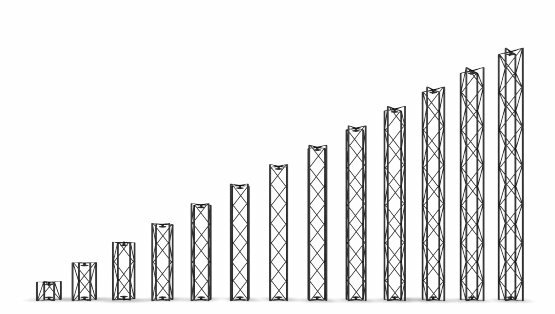 Individual solutions Your vision – our task! 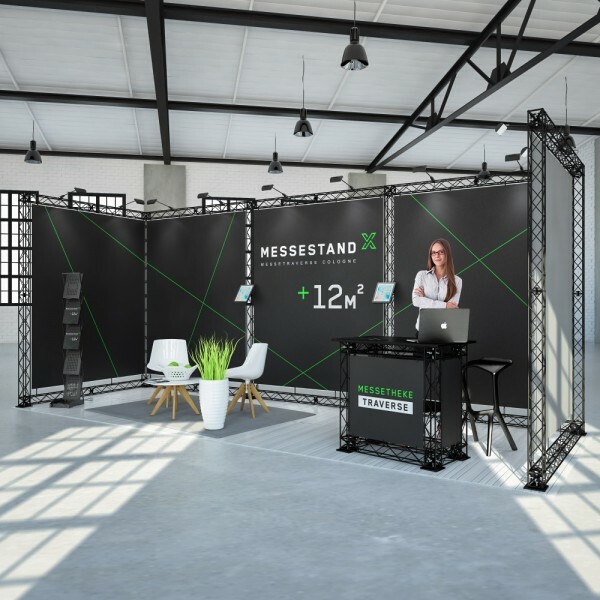 Your truss exhibition stand can be put together quickly, simply and completely without tools. 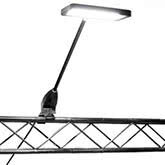 The light elements can be lifted and transported easily. Your individual motif is printed in brilliant 4-colour digital print on special display fabric which emphasises your motif in high-definition and in an impressive way. The graphics can be washed. 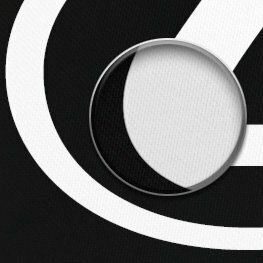 The printed graphics can be changed completely without the use of tools in no time at all. 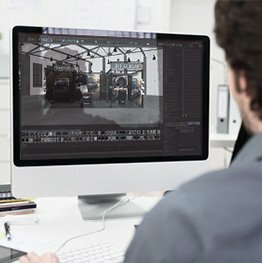 A clever clip system connects the graphics with the system and ensure a perfect tension. 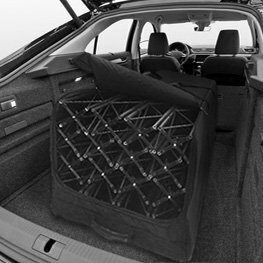 The truss elements can be comfortably transported in a personal car or van easily and in a way that saves space. High-quality transport cases guarantee perfect protection and simple handling. 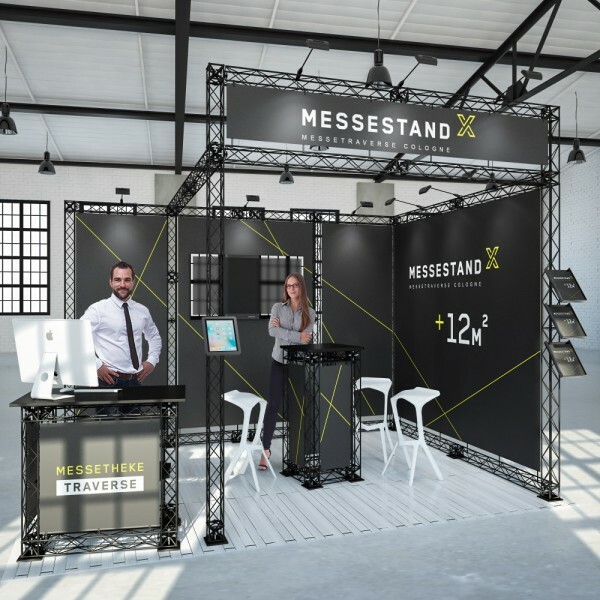 The individual truss elements can be put together in numerous shapes to create diverse exhibition stands for almost any number of square metres. 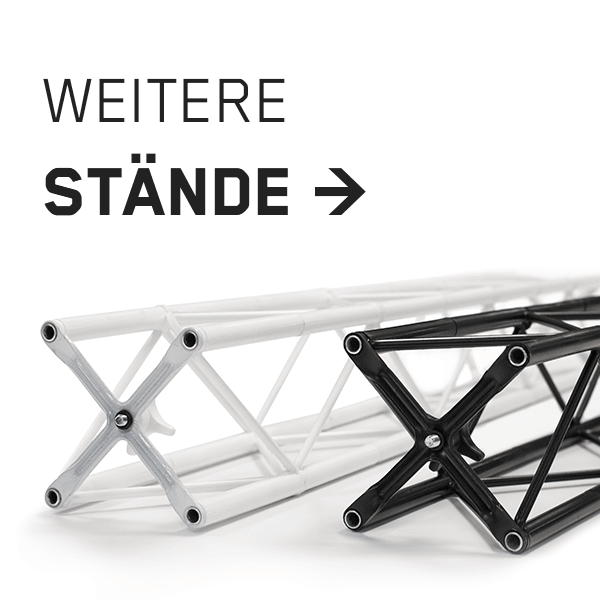 The truss elements consist of a fibreglass composite system and are available in black or white. For a modern visuals and the best stability. 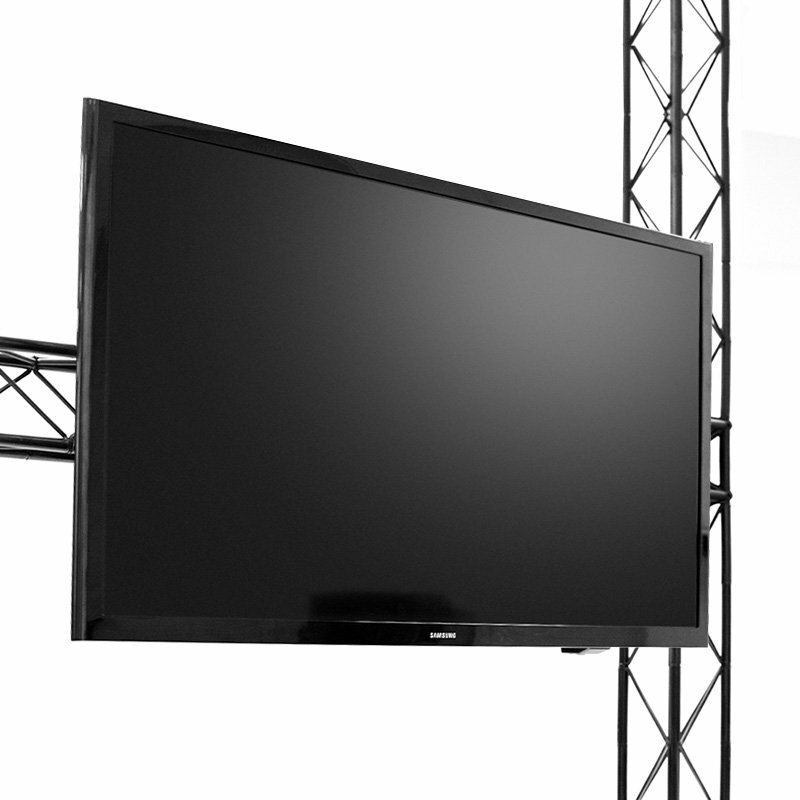 Add rack options, brochure stands, seating furniture, advertising counters, monitor brackets, transport bag or case, halogen spotlights with adapters and much more. 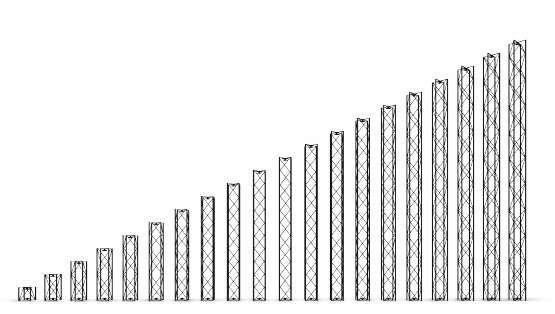 Numerous expansion modules such as counters, cubes or columns are also available in the truss building style. 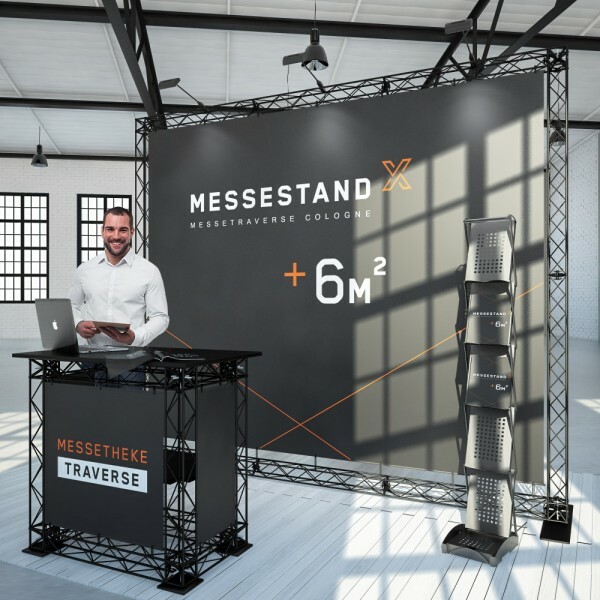 Simple assembly and reshaping of your exhibition stand, completely tool-free! 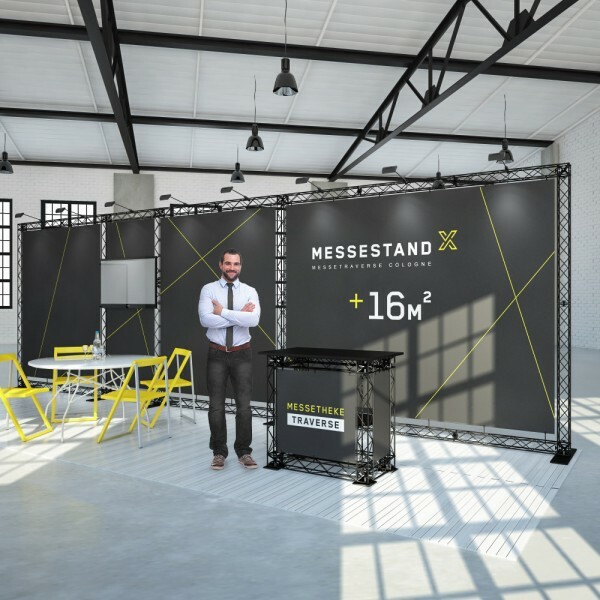 Our service team are happy to advise you in detail about your truss exhibition stand. 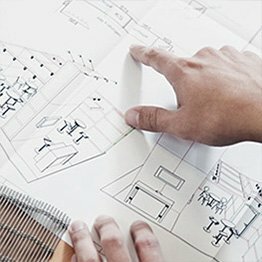 Your requests and requirements take top priority with us. 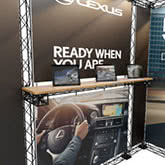 We can place your brand or company in the space and create an exhibition stand which is functional and attractive. 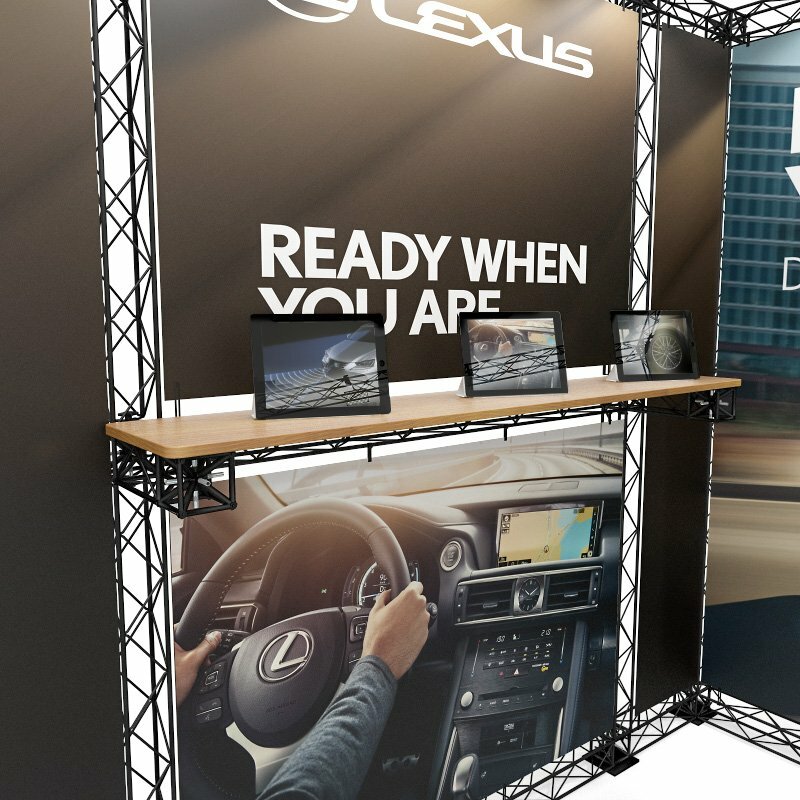 We construct and visualise all elements with the most modern programmes – you receive a detailed 3D preview of your exhibition stand. 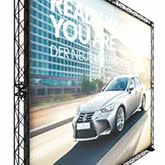 Present your exhibition stand and convince internal or external decision-makers of the high-quality result. 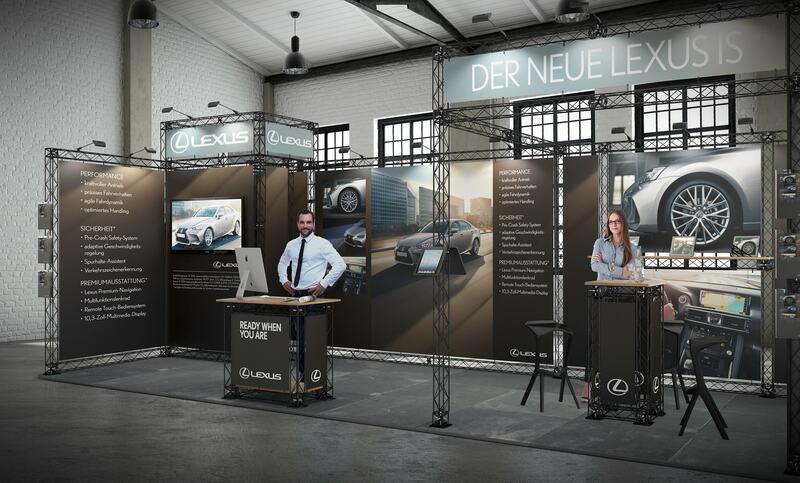 Let us advise you personally and experience your exhibition stand live over an exhibition space of 600 m². We focus on eco-friendly inks and gentle printing processes.